Want to be a part of Put People First PA’s work fighting for health and dignity? 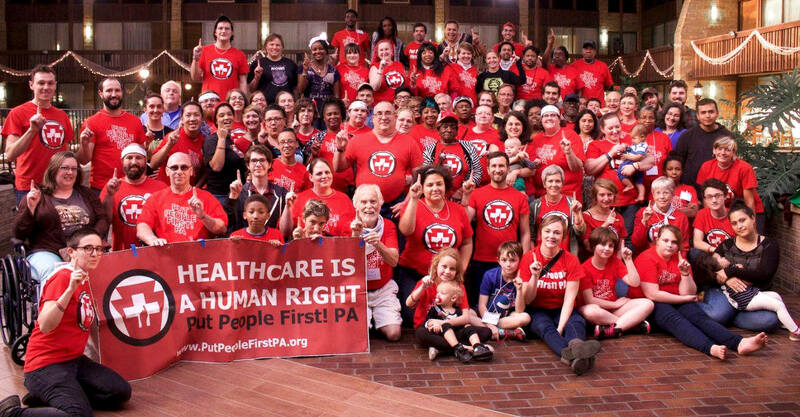 Become a part of our member family uniting across Pennsylvania to win healthcare for all. Put People First is a basebuilding organization and open to all. We believe in the leadership of everyday people. Our membership is multiracial and multigenerational, with people of all genders, abilities and ethnicities. We are not party-affiliated and we have large cohorts of people from rural, urban and suburban areas. We operate on a shoestring budget of member dues and grants, and most of the work of PPF is done by member volunteers. Be a part of PPF by becoming a dues-paying member (see the form below on this page), subscribing to our email list, and joining a regional healthcare rights committee or volunteer team! Fill out the form below and press the submit button to enter your payment info and become a dues-paying member of Put People First! PA! We use a simple and secure service called Stripe to process credit cards. If you want to become a member, but can’t pay dues electronically, email info@putpeoplefirstpa.org and we can figure something out together. You can email dan@putpeoplefirstpa.org if you run into any trouble at all. If you’d like to pay with a check: Checks can be made out to our fiscal sponsor, Resources for Human Development, with Put People First PA in the subject line. Send checks to Resources for Human Development at 4700 Wissahickon Ave., Suite 126, Philadelphia PA 19144. Note: This form is to sign up as a member of Put People First! PA. If you’d like to make an individual donation, you can make a contribution at our donate page. Abide by the human rights principles of accountability, equity, participation, transparency, and universality in my work with the organization. How much would you like to contribute as your monthly membership dues?